A Safer Way To Feed Kids. All Natural and Good For The Earth. 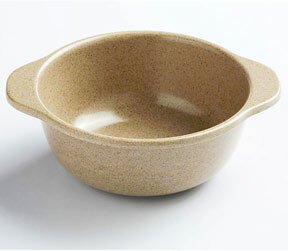 A natural fiber bowl that is totally safe for people and better for the environment. It looks and feels like plastic, but is made from a unique natural material derived from rice husks. These plastic-like dishes are a safe and practical alternative to traditional versions. They are super thick and virtually unbreakable, yet remain all natural and 100% biodegradable. Able to withstand high heat, be washed in the dishwasher, and used in the microwave, these soup bowls will even outperform many of those regular plastic dishes. They are also super easy to clean since they allow for less sticking and staining when compared with regular plastic dishes. Help reduce waste by choosing a more environmentally friendly way to feed your kids. The perfect size for soups, cereals, oatmeal, noodles and more. This great soup bowl holds up to 8 ounces of your child's favorite food. Integrated handles on either side make it easy for little hands to grasp and maneuver, and also allows for a cool spot to hold when transporting hot dishes. The perfect depth for small hands, this bowl makes it easy for small children to feed themselves and thanks to thick, natural fiber construction, it remains sturdy, stable and virtually unbreakable. Dimensions 5.5" x 4.5" x 2"
Little Husks Soup Bowl - A safe and practical way to feed your children. Made from a food by product that would otherwise be destroyed, these plastic bowls are an environmentally friendly alternative to traditional kid's dishes. 100% Biodegradable. Order Yours Today!